2016 Reissue - 15th Anniversary! Limited Edition of 500 copies on Silver Vinyl! 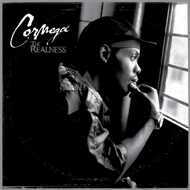 The Realness is Cormega's "Official" 1st debut studio album that was originally released in 2001. The album features production by Havoc (of Mobb Deep), Ayatollah, Sha Money XL, J Love, Godfather Don, Jae-Supreme, The Alchemist, Cormega and others. Guest appearances by Prodigy of Mobb Deep & Tragedy Khadafi. Now in celebration of the 15 Year Anniversary, Red Line Music Dist. in conjunction with Legal Hustle and Slimstyle are re-issuing this classic album on Special Limited Edition Silver Opaque Colored Vinyl in a Black & Metallic Silver colored jacket!